Got left-over rice? Let’s give it a new delicious twist. Sounds great, right? 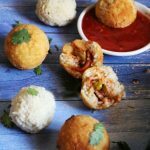 As part of the series of recipes with Rice that are creative, fun and delicious, this recipe of Vegetable-Stuffed Rice Balls is not only delicious but is an awesome way to use those left-over rice and turn them into crispy and flavorful snack. 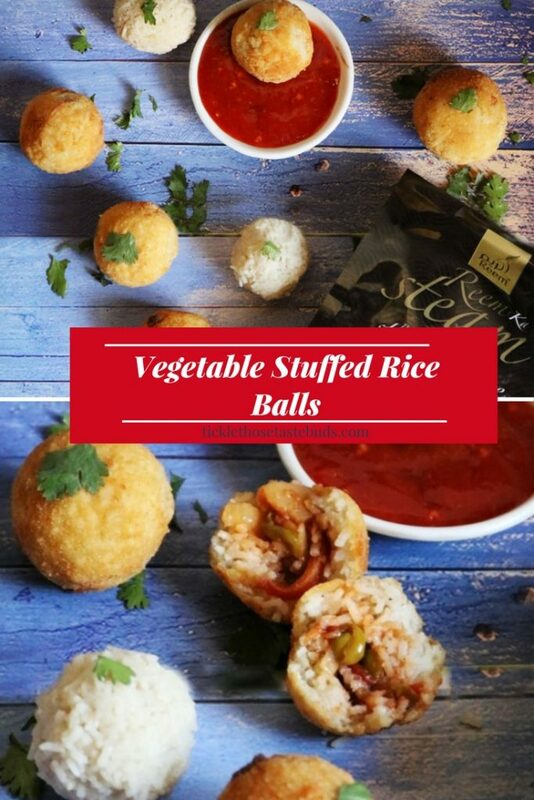 Inspired by the Italian favorite Arancini (Italian Rice balls) that are made with Risotto (Arborio rice, an Italian rice variety), these Vegetable-Stuffed Rice Balls are made with Basmati Rice. 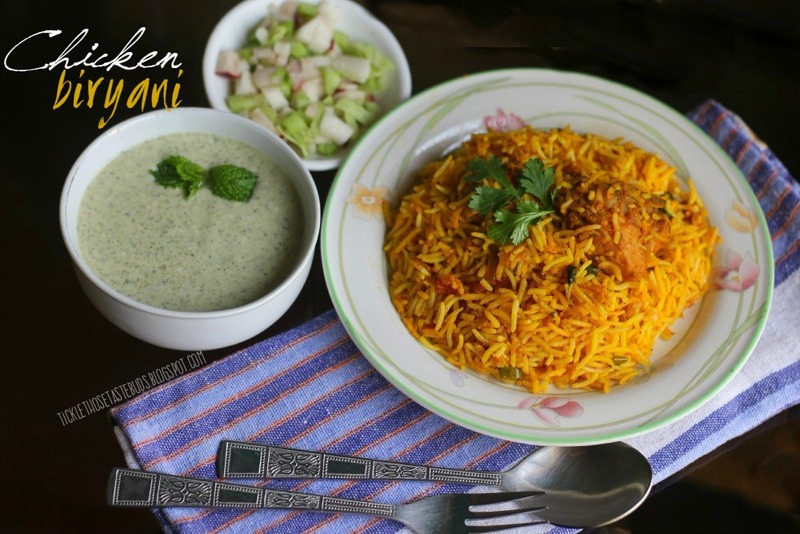 I’ve used Reem ka Steam Basmati Rice for creating this recipe. I had so much fun working on rice recipes and specially with Reem ka Steam Rice as the rice quality is great. It’s long grain rice, fragrant and takes less time to cook too. 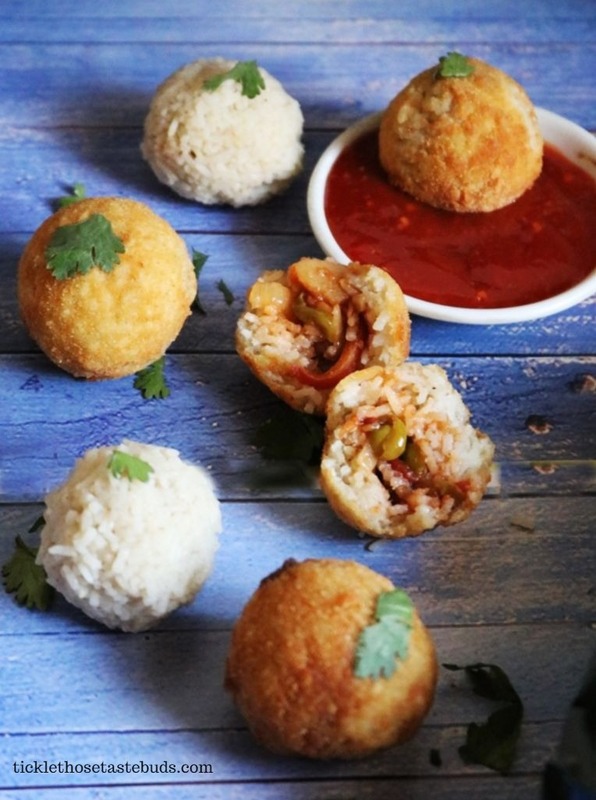 What makes these rice balls even more exciting is the stuffing. The crisp outside, soft creamy inside with colorful vegetables, the combination is delicious. The breadcrumbs give the added crunch to it, making it even more crispier. I’ve used vegetables as stuffing for rice balls, you can use meat, cheese or any kind of stuffing as per your liking. You can be as creative as you want and go according to your taste palette. If you like this recipe, check out other ones on the series Rice Recipes here and here. 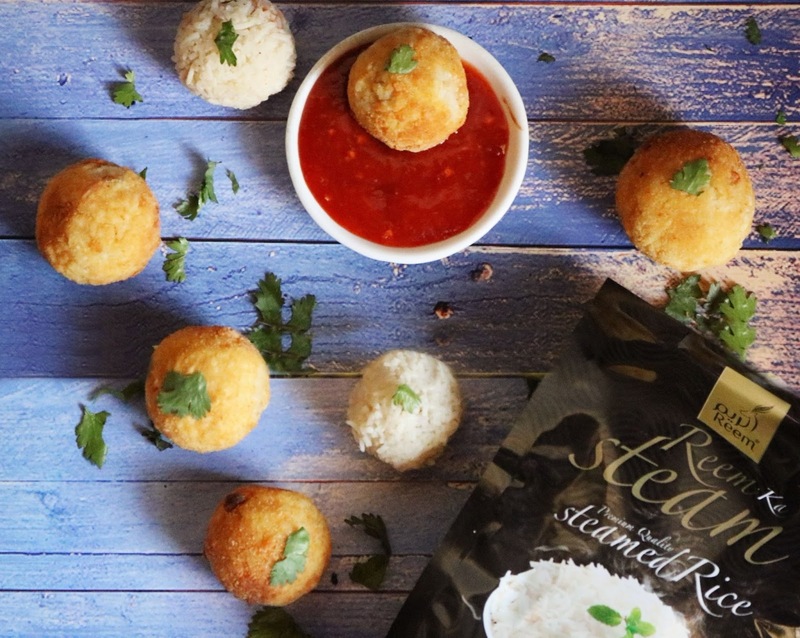 Cook Reem ka Steam Rice according to package instructions. In a large sauce pan bring Chicken Stock to a boil add rice and black pepper. Cook over a very low heat, stirring frequently until the stock has been absorbed. Rice will look overcooked but a perfect texture for rice balls. Keep aside to cool completely or refrigerate overnight. In another sauce pan over medium heat add oil, green chilies and minced. Saute until light golden and fragrant. Add the vegetables and the seasonings and stir. Cook until the vegetables are soft. Taste check and adjust the seasoning as needed. Prepare the breading station: In a deep plate beat the eggs and season with a little salt and pepper. In two other deep plates keep flour and bread crumbs. To make the rice balls: Put some cooled rice in your hand keeping it cupped shaped (make sure you wet your hand a bit for easy handling) and flatten it. Place a tablespoon of filling and a pice of mozzarella in center along. Add a little more rice on the top and start closing it around filling into a ball shape. Dust the rice balls with flour, then roll in the egg and then in breadcrumbs until completely coated. Heat the oil in a deep frying pan and fry the rice balls until golden. Drain on kitchen paper. Great! this is so perfect for the thanksgiving!I want to make one, it seems challenging. They look so yummy and this recipe looks so easy to follow! 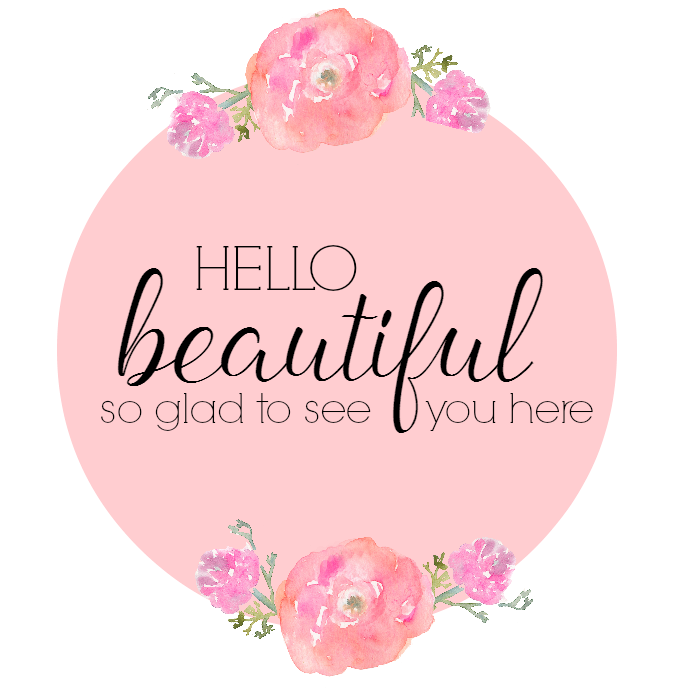 Such a wonderful post and I love this imagery also – looks so yummy! I've never tried to make these because they seemed super complicated – but your recipe makes me feel like it's something I could handle! I love that this is a good veggie option too, I don't think anyone in my house would miss the meat! This looks like an easy recipe to follow, and it's a great break from eating meat at all meals. I'm curious if this is gluten-free? I'm new to going GF, so I'm just wondering. I love a good veggie meal that I never made before. 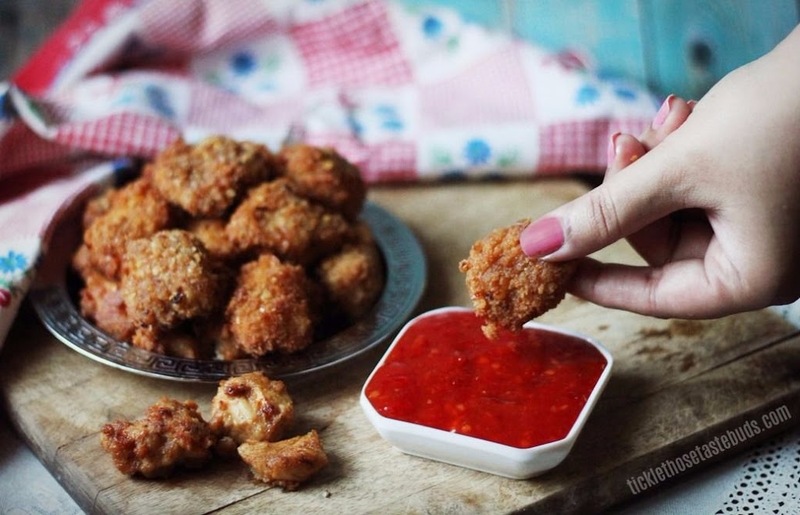 These look so tasty and my kids are always waiting for a new meal to break up the monotony. I've gotta be honest, rice doesn't last long in my house, but if we ever do have some leftovers I'll be sure to try this recipe!! Yum!! Yum! I wouldn't have thought to do this, but what an excellent use of leftover rice. Saving for later and can't wait to try! 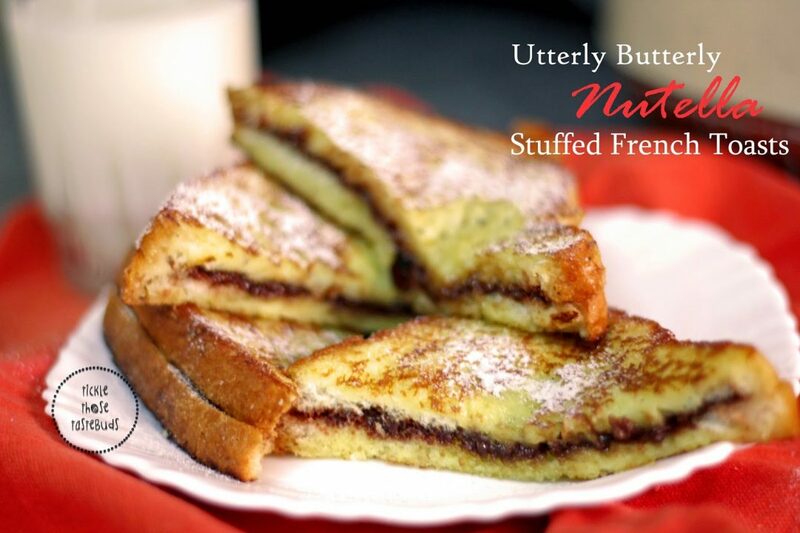 This sounds so delicious and easy to make too! Great for leftovers too. These look super delicious! 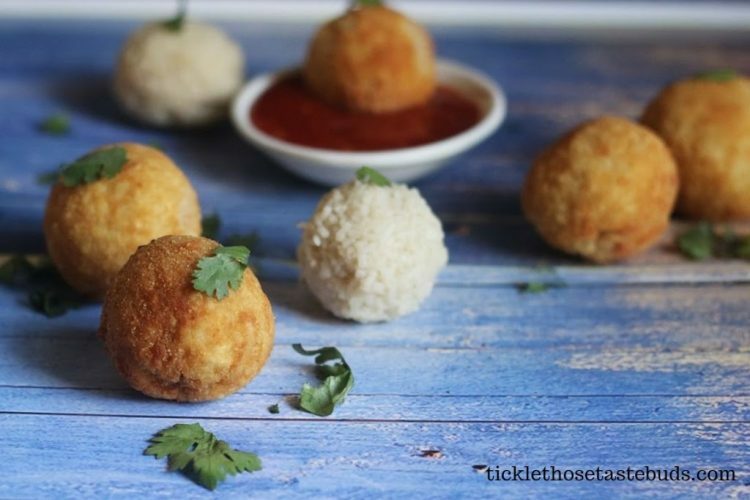 I've never attempted making rice balls but now I want to make these! Winner winner chicken dinner! These look so good and I know I would love them. I don't know if I can stop at one or two though. I totally need to try these! I know that my family would love them! Rice balls sound so good. There's a restaurant near me that serves giant rice balls, but I've never tried them. This is such a good idea to make use out of leftover rice. I'm sure they're great. Wow these look to die for! I would love to try making these for my family sometime! I think they would love it! These look super easy to do and something I think even my kids would love to eat. Great idea! We *always* have leftover rice! This is a great option, and you've made them so easy to make! I honestly have to admit that I have never had rice balls. This recipe looks interesting and best of all easy to make. Thanks for sharing. Well these rice balls look so appetizing. I love rice but had honestly never thought about eating in such a different way. I bet my littles would love these. Thanks so much for sharing. Bookmarked!! I'm surprised I'm saying this, but I love that they're filled with veggies.